Despite the major difficulties inherent to such an ambitious program, the first prototype of the A-12 was ready to fly in less than two years. Concurrently improving the JT-11 was a much slower process, and the initial flights of the A-12, in 1962, were carried out with the Pratt & Whitney J-75, only half as powerful but already proven. The maiden flight of the A-12 took place on April 26th, 1962, three months ahead of preliminary flight trials of the new engines, 3 years, 4 months after the governmental go ahead was given. Numerous tests were carried out on the prototypes and pre-production engines before flight testing in an A-12 was undertaken. One of the problems which had to be overcome was that so far no engine had explored these performance ranges, so no regulatory documentation existed. Pratt & Whitney would not only have to prove their new motor, but also simultaneously establish validation procedures. Featuring amongst large number of tests were prolonged endurance tests of engine-functioning over a duration of 150 hours. As no test bench would possibly simulate the overheating likely to be encountered in service, it proved necessary to build one for that specific purpose. The adopted solution included the exhaust flow from a J-75 engine to supply hot air to the intake and casing of a J-58 during a course of experimentation. Furthermore, available instrumentation did not make it possible to obtain the required results in real time. 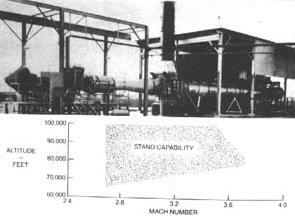 As soon as Pratt & Whitney developed more robust measuring instruments and adapted calibration techniques to suit, much more precise results were registered. Lockheed was kept informed on how things were progressing and on the analysis of acquired data. In the course of July 1963 the final pre-flight engine tests were successfully carried out. It was not until January 1963, nine months after the maiden flight of the A-12 that 60-6924 received the first J-58 installed in the starboard nacelle, so that at last the first flight tests could be undertaken. From the outset the J-58 proved to be tricky. 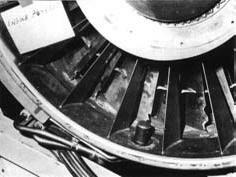 Due to the unique nacelle geometry and the considerable gluttony of the JT-11, the compressor suffered from air deficiency. The wind-tunnel models had not established well enough the mass of airflow which was demanded by the engines. At first, this problem forced Lockheed to start up the engine with certain access flaps open, and, in any case, to alter the aerodynamics of the fairings and to install two extra air-ducts downstream of the compressor to eliminate the trouble when it occurred. The first A-12 flew for some months with one J.75 and one J-58, almost up to the final stage of testing. But the greatest difficulties were to appear during in-flight trials. The J-58 proved to be extremely vulnerable to ingested debris. The great thrust, its immoderate thirst for air and the tortuous intake system over the complex nacelle structure, meant that the smallest nut, bolt or fragment of metal forgotten at the factory was subsequently ingested - with disastrous consequences. The smallest piece of gravel or asphalt on the taxiways or runway would cause catastrophic damage. Many unfortunate events marred the first trials, caused by ingestion of gravel or other foreign bodies such as the manufacturer's logo which had to be moved to another location to prevent it to be ingested in the future. One day an inspector, assigned to the removal of foreign objects from the intakes, forgot his flashlight in one of these. This was duly ingested whilst running-up the compressor. The resultant bill for damages came to $ 250,000. An intensive campaign against foreign objects of all kind was introduced at all stages of manufacture and operational trials. The tests and checks were practical in nature and accompanied the nacelles throughout manufacture. Blanking covers were fitted everywhere, warning signs were positioned visible to all workshop personnel, the runway and its environs were systematically swept twice with the greatest care along the route taken by the engines. By these means the problem was reduced to a more reasonable proportion. The rather complex system of the air-intake made an even supply of air to the compressor difficult to achieve. It was subject to sudden drops in airflow, provoked by numerous flight maneuvers of the aircraft which caused compressor unstarts. This chronic Blackbird problem was not really solved until computers had been perfected which allowed compensating the slightest fluctuations in supply to prevent untimely unstarts. This forced Lockheed to replace the pneumatic air-intake control system with a more efficient electronic system, despite related complications caused by heat and vibration. Nonetheless this critical aspect of flight at low altitude would remain, making the handling of the SR71 always a difficult task. Many other problems to be solved cropped up during the in-flight testing. Kelly Johnson told that during one of the first flights, as a result of a sudden unstart, an A-12 had to make an emergency landing, but the engine casing had cooled down faster than the inner body; the compressor blades made contact with the 'shrinking' casing inner wall. This provoked "one of the most impressive firework displays on earth" to use the description given by the Skunk Works chief-engineer. To avoid re-occurrence of such an incident, pilots had to maintain power during the descent, so as to hinder too quick cooling during deceleration. In emergencies the pilots had to cut the fuel supply completely so as to recover safely. The very high temperatures encountered during flight-testing compelled the engineers to develop adequate new measuring instruments, or alternatively to adapt instruments available to the difficult ambient conditions encountered by the J-58 in operation, and for which they had not originally been designed. Therefore the trial units were cooled using a water system, specially fitted only for that purpose, so as to acquire the data necessary at that stage of testing. Many thousands of measuring points were plotted during this stage of testing, particularly to study airflow at the air-intake and jet-nozzle. Later a second J-58 was installed in the port nacelle, replacing the J-75 which had been fitted. If the initial difficult testing tended to confirm fears that performance would be below that expected, these were subsequently, little by little, relieved thanks to the joint efforts of Pratt & Whitney and Lockheed. Test pilot Bill Parks, who conducted the first Mach 3 flights for Lockheed, stated that he had at his disposal a propulsive thrust more than twice that provided by the combined engines of the "Queen Mary". Serious wear and cracks which appeared the long drive shaft between the engine and its gearbox, also posed several key problems related to the torque and fatigue on the shaft support bearings. The propulsion engineers had to provide data, although they were incapable of knowing exactly the relative positions of the control box to the motor during operating tests, at the time calculations were not sufficient. Measurements had therefore to be taken during flight. These evidenced, amazingly, a displacement of about 4 inches (12 cm) of the gearbox from the engine during high speed flight. The gearbox was then unable to support the shaft, which not surprisingly was often found to be twisted. The problem was solved by providing a new shaft containing a double universal joint. The fuel system, upstream of the engines also showed signs of fatigue and distortion. Measurements taken using a fast recorder indicated that the fuel supply pressure to the engine was going off scale. This over-pressure was fouling the engine hydraulics system. 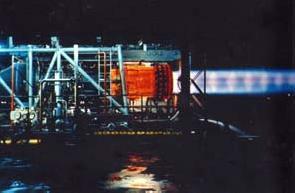 The phenomenon did not show up either during rig testing nor during engine ground testing, because of the minimal quantities of fuel involved. To solve the problem Lockheed designed a "high-temperature sponge", (promptly nicknamed "football") which was installed in an accumulator ahead of the engine. By this means pressure spikes were reduced to acceptable levels. The major difficulties encountered during flight trials appeared in the phases of transonic flight. Under certain conditions, the outer half of the nacelle would rotate into the engine and crush the engine plumping and anything else in the way. Pratt & Whitney had to totally re-design the attachment points at the rear of the engine. The initial stiff rails located above the engine, reinforced by a bracing strut between the motor and the casing were replaced by tangential links between the lower engine casing and the external nacelle. This maintained a finite distance between the nacelle and engine under all conditions. 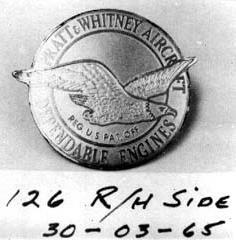 It is strange to think that, although Pratt & Whitney had reached a paranoid level with the high-temperatures and the almost impossible cooling requirements, their engineers had neglected to consider that, during certain stages of flight, the fuel would be cold whilst the ambient environment was hot - and vice-versa. When these conditions occurred the fuel supply and ignition systems would malfunction. To remedy this it proved necessary to install heating for the main controller and to tweak servo responses. To adequately conduct the "high temperatures" tests of the J-58, a special test bench was installed at Wilgoos to send the hot exhaust air of a J-75 engine directly into a J-58. The J-58 was an engine conceived to operate continuously at Mach 3 with the after burner on for the duration of the flight, providing spectacular results: seen here is a J-58-P2 at the test bench, at night, with red hot after burner exhaust "Diamond" shock waves can be seen in the burning discharge. J-58 metal insignia almost intact after being ingested by its compressor. After that, the factory marking was engraved directly on the engine case. J-58 air inlet after the ingestion of an inspector's flashlight in charge of checking for foreign objects…Total damages: $250,000. 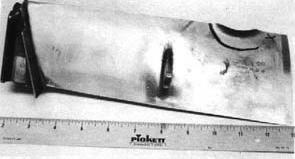 First stage turbine blade of the same J-58 after impact by a flashlight. 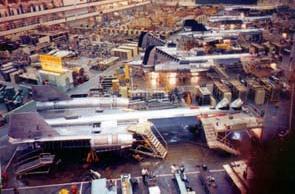 Above: This superb view of the SR-71s assembly plant depicts some of the precautionary measures taken following the problems encountered by the powerful J-58s during the first tests. 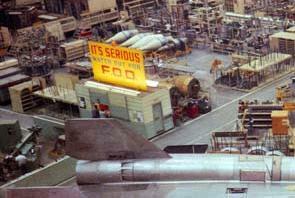 Below: Specifically, Lockheed instituted an awareness campaign for the personnel working on the SR-71s, especially displaying large warning signs alerting them to be on the lookout for "FOD": foreign objects damage. The J-58 final version: the J-58-P4, alias JT-11-D20B, with its typical six-vein bypass.